In a rush? Never enough time in the day? And if you decide once you're here that you'd like to add something onto your list, no problem at all! Do you like this idea? Are there ways we can make it better? Please let us know! You can email us at : dktackandsupply@hotmail.com, or leave a comment on our DK TACK AND SUPPLY facebook page. *We suggest E-Transfers be sent a minimum of 2 hours prior to pick up time to ensure it has time to be processed. Orders cannot leave the store unless payment has cleared. Orders not paid for through E-Transfer will only be held until the specified pick-up date unless other arrangements are made. In fairness to other customers during sales, Sale Items will only be held with E-Transfer payment. 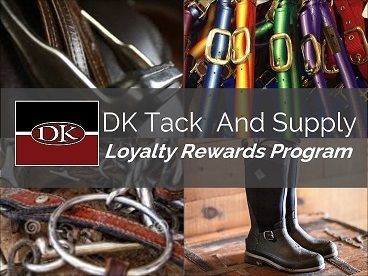 You can earn Loyalty $* when you make Tack Shop purchases at DK Tack and Supply and redeem your credit in store! It’s our way of saying “Thank You” for your continued support. The more you buy, the more you earn! ** It’s that easy. And DK Tack and Supply Loyalty Rewards members will also get exclusive access to “Member’s Days” discounts, special sales and promotions, and will also be able to earn Loyalty $ for FB campaigns and referrals. You can sign up on your next visit to the store, here on the website (see above) or on our Facebook page : www.facebook.com/dktackandsupply. *Loyalty $ cannot be redeemed for cash. They are for use as store credit only. **Shavings, bedding pellets, hay cubes and all feed products are not eligible for earning full Loyalty $. CLOSEOUT items are ineligible for Loyalty$ as are some sale/discounted items. Loyalty $ can however be redeemed when purchasing these products. DK Training Centre Inc/DK Tack And Supply reserve the right to end this program at their discretion without warning or notice. All Loyalty $ accumulated, should the program end, will be eligible for redemption within 90 days of the closing of the program. DK Training Centre Inc/DK Tack And Supply will not distribute or sell your information for any reason. It will only be used to contact you to inform you of sales and promotions available to you as a Loyalty Rewards Program member. Follow Us On Facebook to stay up to date on all sales and events! 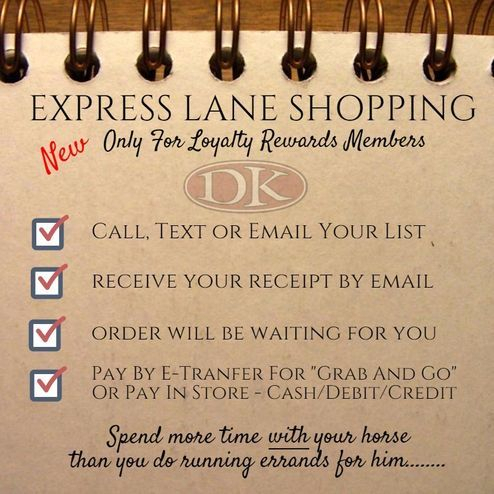 DK TACK & SUPPLY Loyalty Rewards Program! Please Note: I have just discovered (Nov 2015) that the other widget for joining the Rewards Program does not work! So I have added this one to replace it. IF you thought you were signed up but have not been receiving our emails with specials and sales, please add your info above and we will add you to our system. Sorry for any inconvenience this may have caused.